A linear walk, 15.9 miles. 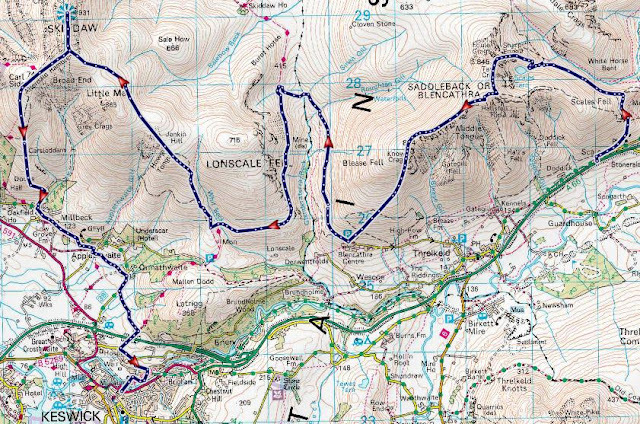 A superb linear Northern Lake District fell walk starting at Scales, that takes in the knife edge ridge of the legendary Sharp Edge - Blencathra, and then continues to the fell's loftier neighbour, the mighty Skiddaw, before heading into Keswick. This walk I had been planning on and off for over a year. I had wanted to do Blencathra in particular after seeing it featured in various documentaries, books and walking magazines. I also wanted to scale it via the infamous Sharp Edge route, which has a certain notoriety as a dangerous place that has claimed its victims over the years. Blencathra or Saddleback as it is also known, is a fantastic looking mountain, it was Alfred Wainwright's most written about fell too. It stands next to its mighty neighbour - Skiddaw, of which if possible I wanted to scale on the same walk. The Lake District is new territory to me. Apart from a day trip to Windermere about 20 years ago as a kid, the place has always been the stuff of legend. Those distant Lakeland peaks always look so inviting when visible on a clear day from the Pennines, so these two fine mountains I'd chosen for my Lakeland walking introduction looked like a good start! I was going to arrive into Keswick at around 13:00, so a very late start to any walk, especially with the nights closing in again now, so I would need to stay overnight - or Wild Camp out on the land, which I was looking forward to doing to test out my new one man tent. The forecast was mixed, the Saturday I'd be arriving on was set to be sunny turning cloudy as the day went on, but the Sunday however was looking set to be a bit wet. So it was a train journey along the full route of the famous Settle - Carlisle line, then a bus from Carlisle to Keswick. The journey was great, opening up some more walking ideas from stations beyond Langwathby, and the bus journey was great as it snaked its way passed Bassenthwaite Lake and the flanks of Skiddaw into a very sunny and to be honest, hot Keswick. I felt a bit over dressed in my full mountain attire whilst all the other folk were walking around in shorts and t-shirts. I then had to find a taxi in this town so I could get to Scales to start my walk, this proved a task worthy of a blog entry in itself to find, in the end resorting to my phone based map navigator to find the seemingly one and only taxi company in Keswick which was in a residential street some way out of the busy town centre. On asking the couple if they had done the mountain before, which I was sure they must have done, they replied not at all, and I detected a German accent this time. They had apparently done most of the famous mountains in Europe, but had come to see what England had to offer. So here we were, three people who had never scaled Blencathra before on one the most notoriously dangerous arêtes in Lakeland, this was set to be fun. Foule Crag was a great experience, I was in my element climbing up the grade 1 scramble. And when making it onto the summit path of Blencathra, it was a real rush to know that I'd got here via Sharp Edge. An awesome moment indeed! The old Cumbric name of Blencathra was re-popularised by Alfred Wainwright after noting the mountain as Blencathra in his famous guide books. Since the Victorian times the mountain was known as Saddleback due to its distinctive shape. However this has meant that Ordnance Survey still haven't made up their minds, as both names are noted on the OS maps. So the next day was set to be wet, and there had been some slight rain in the night. There had also been some big gusts of wind in the night too down the slopes of Lonscale Fell that rattled my new little tent! So I wasn't hanging around on here. My new camera was now getting water logged, and the weather was only getting worse. My chosen path off the summit was a tricky descent down across the slippy slate scree, this was pure scree surfing now, and at one point it seemed that the entire mountain side was on the move with me! My camera by now was out of power, and dripping (somehow it's still working) so that's the last of the pictures. The route continues steeply downhill across more tricky and slippy ground, across Carl Side, and eventually back into Keswick. It was even grim weather in Keswick, of which after fish and chips was time to get my bus back to Carlisle for the train back to Leeds. Overall a fantastic walk taking in two of the finest fells in the Lake District. Skiddaw was a struggle due to its steepness, and it was a shame with the weather. But Blencathra was an awesome experience, especially doing it via Sharp Edge. Sharp Edge is a very dangerous place though, I have posted a link at the end of this entry to the Keswick Mountain Rescue Team's list of incidents on that ridge. Ah bless you - me and my partner went to wild camp at Scales Tarn on the Friday night intending to do watch the sunset from Sharp Edge which we've done a few times before - lugged our heavy packs up to the tarn and tried for half an hour to get the tent up in the gusts of wind - but it was just too windy - the tent nearly ended up in the middle of the tarn so we finally gave up and trundled back down to the car and set the tent up there and my word it was windy!!!! We did Skiddaw on the Saturday when you were doing Sharp Edge and decided against walking on Sunday because of the awful weather - I remember looking up at Skiddaw through the rain clouds and saying - I bet there's some mad walkers up there (and it's usually us to be honest!) and now I know there was at least one mad walker - you! Thanks for sharing I enjoyed that - Blencathra's my favourite Lakeland fell especially via Sharp Edge! Haha that made me laugh! Your right must be mad to have done Skiddaw that morning - although I knew the forecast so the heavy rain was expected. Walking through Keswick that morning dripping wet was interesting, I still went for fish & chips at a restaurant though, I certainly got a few looks. It was a shame though as the view must be amazing on a clear day from Skiddaw summit. Sorry to hear your wild camp didn't work out at Scales Tarn, certainly is a great spot for it. I want to return soon - so looking for my next Wainwright to scale - thinking of Helvellyn perhaps. yes the view from Skiddaw is fab on a clear day - will be posting photos of the walk on my blog soon - they're still in the camera at the moment! You'll love Helvellyn - got to be done by Striding Edge of course!! Sharon, I will look forward to seeing the photo's - throw me a link when you upload them. Many thanks Samantha, glad you enjoyed this one! Steve Gilbert. Travel theme. Powered by Blogger.